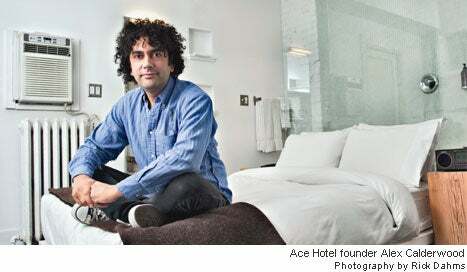 Ace Hotel founder Alex Calderwood did it by transforming his company into a lifestyle brand. Meet the man who set a new industry standard with the 'it' hotel. The Ace Hotel brand is so cool, it even has its own special-edition Converse high tops. 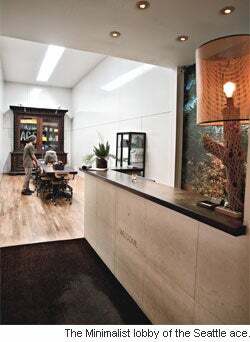 Alex Calderwood, co-founder and creative mastermind behind the industry's hippest hotel properties, is showing off a pair to his business partners, Wade Weigel and Doug Herrick, in the airy, stripped-down lobby of the Seattle Ace. Once the kicks go on sale next month--$100 for the midnight blue two-toned, gummy-soled style, with only a few hundred pairs available exclusively at the hotel's shops--Calderwood will join a short list of people deemed cool enough for the privilege, like designer John Varvatos and Outkast rapper Big Boi. This is rock-star status, without the rock star. Calderwood puts the shoes away, turns to approve Herrick's proposal to install Brita pitchers as a room amenity ("I love it--do it.") and OKs the franchise manuals ("These are fantastic!") for the Rudy's Barbershop chain, another of his successful ventures. This is how he operates, all the time: frenetic, yet somehow effortless. And if his energy seems better suited to a creative genius than a traditional hotelier, that's because he--and his business creations--are anything but traditional. His appearance helps: wild, curly hair, skinny jeans and a blue button-down with a bunny etching over the shirt pocket. He's also rocking another set of limited-edition Converses--this pair from Japan. Ace Hotels reflect Calderwood's individualistic spirit. Seattle's Ace--the chain's first--is like nowhere you've stayed before. Located in a bustling downtown bar district, the hotel has unobtrusive double glass doors that open onto a flight of stairs leading up to the front desk and narrow hallways that resemble a modern art installation. 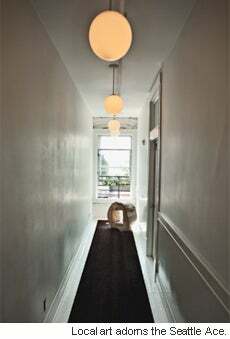 The building's 28 uniquely decorated rooms (some share bathrooms and one boasts a revolving door and private deck) have been transformed into bright, understated spaces, with Vizio flatscreen TVs, platform beds and exposed bricks and pipes. The shower curtain is a red recycled welding curtain, a copy of the Kama Sutra sits next to a Bible with a camouflage-style cover and the vending machine sells hangover pills, playing cards and Botan Japanese rice candies. The most unusual part? Rates start below $100, so weekends are regularly booked a month in advance. And, in fact, Calderwood and his partners planned for only one hotel, but following the immediate success of the 1999 opening--Ace Seattle was cash flow positive before the first year was up, with an occupancy rate on par with established hotels' during its second­--they decided to open larger locations in Portland in 2002, Palm Springs, Calif., in 2009 and Manhattan earlier this year. "We've actually exceeded our own projections," Calderwood says. And most likely everyone else's, given the continuing economic gloom. "It's the most successful hotel model in New York right now," says Chris Mohney, senior vice president of content at BlackBook Media, a New York publisher of city guides, a magazine and website devoted to hotels, restaurants and nightlife. He says the recession killed the big, expensive hotel model and Calderwood has filled a niche. "It's a personality-driven hotel, so creating that kind of success is more alchemy than science," he says, noting that one of the biggest innovations is the creation of a "lobby scene" that encourages people to linger, coffeehouse style. "It's a madhouse around lunch." Calderwood didn't break the bank creating it, either. He financed the first hotel for less than $2 million, through an equal mix of debt and investor and personal money. Four hit hotels later, it's clear Calderwood has discovered a way to engineer the vibe of a lifestyle brand, complete with product collaborations, agreements with local vendors and partnerships with independent artists. Most recently, he collaborated with three independent film directors associated with the social media website Massify, providing the New York Ace as a location for three short films--a genius marketing ploy that cost next to nothing. Now that the dust has settled in Palm Springs and Manhattan, Calderwood took a moment out of his crazy travel schedule to chat with Entrepreneur about what's next--and all he knows (or is willing to reveal) about the art of creating a cool business. The shoes are just the beginning. You opened up two hotels during a downturn. Did anybody tell you that wasn't a good idea? I think in any industry, if you are offering something special and have an understanding of your customer, in good times and bad, you'll adapt and prosper. We are flourishing because our positioning and our brand [coincided] with a shift in what people are looking for. If we had been a more generic product offering, I would have been more freaked out. But your hotels were immediately successful. How did you achieve that? I can't give away my secret sauce! Ha--I wish I knew. But one thing that's served us well is that we've paid particular attention to embracing the local community. From the point we start, we build relationships with the community by reaching out to local vendors and artists, to get them as emotionally invested as possible. You try to become part of that fabric. 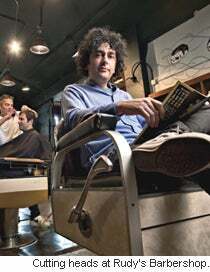 Alex Calderwood racked up plenty of cool points even before he designed a hotel where people want to hang out. He's co-founder of the popular Rudy's Barbershop chain, and he started Neverstop, an internationally recognized multimedia marketing agency (the company is organizing a Kate Spade pop-up shop in London this month). Before that, he owned a Seattle nightclub and worked as an independent buyer for Urban Outfitters. Here's Calderwood's philosophy on how to be cooler than the competition. 1. Create intimacy. There's a right size for every company, so find your sweet spot. "I've learned it's better to have medium-sized hotels and keep them busy and packed all the time than to create a bigger one that isn't," Calderwood says. 2. Be inclusive. Ace Hotels is named after the ace in a deck of cards, which is both the highest and lowest card. "We try to offer something that appeals to everyone," he says. "Don't lose sight of people as individuals--that's how you keep people coming back." 3. Follow the golden rule. "Our approach has always been to think about what we find interesting and how we would want to be treated, and then make sure we stick to that," he says. 4. Be original. Just because something sounds crazy to everybody else doesn't mean you shouldn't try it. But don't jeopardize the bigger picture if it doesn't make financial sense. Because that really would be crazy. --J.W. How does a hotel gel with a local community? A hotel can be a catalyst for visitors to a new city. It's a place where locals and out-of-towners can interact, and often the people who want to stay at a property like Ace are curious about the local scene. Ace's business model is very successful, yet you've said before you don't consider yourself a good business person. I didn't attend business school, so there are a lot of basic things that would have made the process easier if I'd known how to raise capital or anything about debt markets. I think my team and I would have made more money if we'd done things a more traditional way. I think we're very entrepreneurial, though. What we're good at is taking assets that are either distressed or complicated--in some way not appropriate for traditional hotel operators--and embracing the challenges as opportunities to create value. In Portland, the building we bought had a smaller and older elevator, and there was a shared bathroom component. It's also on Stark Street, which is an area that, at the time, would probably have scared off more traditional operators. But we knew from our experience in Seattle that our core customers--creative professionals and cultural enthusiasts--would be open-minded to being in edgier locations. And in New York, we got the Breslin, a really amazing turn-of-the-century historical landmark in a small little neighborhood. You can overlook it because at the street level, it had become an area of wholesale knockoff goods, and it didn't look that pretty. But even if the culture's not quite there, you can tell when a place has good bones. Can Ace foster that culture? To an extent. It takes time, but we do start by looking at the context of the building and the city. We try to create a sense of place in the city you're in. Every hotel is different, but there's a similarity of spirit in the design--an honesty of materials and a simple approach that celebrates the original architecture. How else does Ace do things differently? We're resourceful in the development process. When we take over these old buildings, we try to use as much of the existing architecture as possible. We don't do gut renovations. In all the hotels, we used what was there, so we have all these quirky room layouts. It drives our salespeople crazy. In New York, for instance, there are like 54 different room types. But we see that our customers enjoy it, because each time their room is a little bit different. So there are benefits to not doing things the "right" way. Sure. We didn't come with any baggage of "this will or won't work," and it's served us well over time. I mean, financially, the [Seattle] building was a good purchase, but it was a very, very old building. We didn't think we would do more than one. I owned the Rudy's Barbershops with Wade, and we thought Seattle would benefit from this kind of hotel--so we said, "Let's just do it." And you dove right in. Yes. Naiveté had a lot to do with it, but I think that unconventionality is one of our strengths. As we've become a bigger company, we hear more and more that this isn't how we should do it. But I never [stop] asking, "Why not?" or being willing to experiment. Like with our turntables. I wanted to put turntables in our Portland hotel rooms, and there were a lot of questions about it--about the needles and what would happen if people stole the records. So I just said, "Let's try it with inexpensive records and charge them like a minibar item, and we'll keep the needles at the front desk." If it didn't work, it wouldn't be that big of an investment. It's now a signature element of the company. We have turntables in three of the hotels, and we repeatedly get feedback about them. In fact, I just bumped into a boutique hotel operator who asked me if I'd mind if he put turntables in his rooms. Is the company going through a transition phase? Yes, we're completely restructuring. When we did Seattle and Portland, it was a small group and a design-build--but very satisfying. New York and Palm Springs were more conventional processes because we had development partners. We learned good things from both ways, and now we're rethinking the best way to blend both. What's been the most difficult part of the process? Every business decision comes down to creating a positive working dynamic. We've been fortunate in finding really good talent, so the challenge will come in the next phases in doing more hotels, because it's not possible for me to be everywhere at the same time. We're discussing how to keep the same spirit because right now I'm involved in every aspect of the organization. That's going to have to shift, but I want to stay lean and mean and make sure the resources are focused on the creative side. Will it be difficult to let go? It won't be terrible. I'm not the clearest communicator, so people who thrive here have to like figuring things out on their own. What I'm good at is finding talent on a lot of levels and giving people encouragement and latitude to be entrepreneurial. It may not end up exactly how I would have done it, but I can accept that. How does the focus on the creative process help your business? I love the art of business, and I work like any creative professional. Finding artists or even buildings is an organic process, so I'm always looking around, asking for recommendations. Last night I was reading a magazine and I ended up tabbing one of the artists. I don't have anything for him now, but he sounds interesting, and now his work is in my brain. Something will come up that he'll be perfect for. Is there a company that inspires you? In the fashion industry, you see companies who maintain brand identity but are still able to spread units. Jean Touitou at A.P.C. [a French fashion label] has been doing this for 25 years. They have stores in Europe and Japan, and they're growing in the U.S. But all their consumer touch points still have the same spirit. They're global but still think small. Where are you looking for the next Ace? We're interested in gateway cities like New York and Los Angeles, but there are other cities with something under their skins--Philly, Memphis, maybe Austin. Portland is a good example of this. There's a really rich art and music scene and a great creative corporate culture with Ziba, Wieden+Kennedy and Nike and smaller companies that feed off that energy. That's a good market for us because the type of traveler going there is interested in a property like Ace. So what's next for Ace? The first East Coast Rudy's will open at the Ace New York by the end of the year. We're starting to franchise now, and now have our own brand of Rudy's products. The first of our new limited-edition Converses will be sold [this month] and another will come out in time for Fashion Week in New York in February. For the next five years or so, most of the energy will be focused on the hotels and using them as platforms to add layers to the company. As an example, one of the things I'm looking into now is a video-on-demand system for our new hotels to allow custom programming. That way we can air content and films that we curate. You're going to make staying at an Ace hotel an immersive experience. Exactly. There's not a big expansion plan, but I visualize our business going deeper. We want a collection of hotels--but not a chain. Follow your instincts and do your own thing. What we do works for us, but if you're chasing after something, you've already set an expectation. In any creative field, it's fine to be inspired, but you should figure out your own spin.